"And they are always eating, too!" My friend accused me of confirmation bias, but I was convinced: Anywhere we went in this town, we saw happy people munching on something. It was a sunny and warm spring weekend, it was semana santa, and it was Mexico City. We had picked this often-overlooked capital as our destination for a few leisurely days based on its favorable climate, versatile attractions, and of course because it had recently been named the World's greatest food city. Having previously associated Mexican food with greasy burritos and slobbery tacos served at American fast food joints, I was in for an education. It started with the vocabulary. Recently back from Chile, I had boasted about my Spanish skills, only to find that when it came to reading a restaurant menu here, they were utterly useless. Native language and proprietary names dominated, and my relative lack of familiarity with Mexican food left me pretty clueless. Fortunately, my companion, through previous visits, was able to steer me towards some of the specialities I would otherwise have missed, but was now able to enjoy. What I savored was the vindication of Mexican cuisine, from tangy mole to juicy barbacoa tacos and creamy chiles en nogada. There were more flavors, more textures, and very clearly more freshness than I had experienced before. 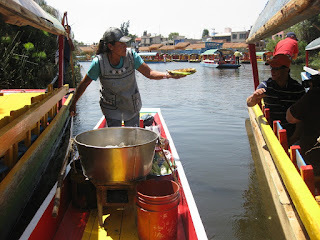 Despite their excellent restaurants, however, the chilangos seemed to prefer the abundant street food. As we ambled from colonial churches to Aztec temples, down leafy boulevards and through cozy neighborhoods, to floating gardens and crowded markets, the choice of food sold streetside kept changing. Would we care for fresh mango with picante? Home-made ice cream? Freshly fried beef al pastor? Candied fruit? Or simply a bit of sweet Easter bread? If we'd emulated the locals, we'd have had it all. Even as we fled into the subway after a long day of sightseeing and browsing, the opulence continued: At each station, a new vendor boarded our train to tout his wares, be it chicles, candy or religious tracts, the latter nourishing more on a spiritual level. Clearly, Mexico City is a foodie's place of pilgrimage. And if this were not yet enough to make me want to return, there is one ancient Aztec delicacy that I will forever be a slave to: Xocolatl.